A bathroom with bathtub. It is 12m2 and its colors are white and blue. The toilets are independent. All linen is provided. For your convenience, a washing machine is available. You can also enjoy the courtyard to eat. This is a perfect place to stay in Carcassonne. It is near the foot of the Narbonne Gate, the main access to la cité. The apartment is very spacious and well equipped with a comfortable bed and living area. The owner is also very helpful and a very nice man. We would highly recommend this as an excellent location to explore the Carcassonne area. There is also an excellent parking space right in front of the building. Jeremy and Sheri, Victoria, BC, Canada. Judy & Jack P.Saint Augustine, FL, U.S.A. 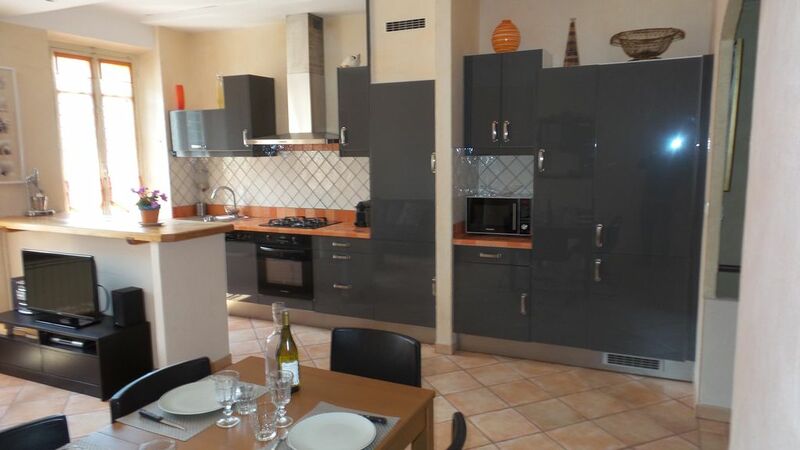 This apartment is in an excellent location for hiking up to the castle in Carcassonne and is very close to the old, historical foot bridge and not far from the center of town. There are several restaurants and a small grocery store just down the street. Having traveled here by car, we found the convenience of the off-street parking a big bonus. The apartment is equipped with whatever you could possibly need during your stay, including a washing machine. The set-up of the apartment makes the bedrooms very quiet. We were concerned about the comments about the window coverings, but did not find them to be a negative at all. In fact, they helped to keep out the afternoon sun. If the weather is good, you can open the windows and easily see the lights of the castle. The outside patio is a nice space for both hanging wash & hanging out. We three senior ladies truly enjoyed our time in Carcassonne. The apartment was way bigger than we had imagined.....thanks to the open concept. Everything we needed was there. Nice to sit out in the private courtyard, and enjoy our meals, and happy hour. The view in the evening of the castle/fortress from the apartment was great. Just a short 5 minute walk to the fortress, and a small grocery store. It takes about 20 minutes to get to the train station, and in the opposite direction a 20 minute walk to a larger supermarket. The only thing that was not a problem for us, but could be to anyway with mobility issues, are the 22 steps to get up into the apartment. All in all we would recommend this place for a great stay in a special town!!! We had a very comfortable 2 week stay in this apartment. Ludovic, the owner, met us on our arrival to answer any questions that we had about the property and was very helpful and friendly. The kitchen was well supplied with a coffee maker, juice press, food processor, pressure cooker, dishwasher, microwave, a generous supply of cutlery, dishes, and other utensils. The bedrooms were quiet and quite spacious and the King bed was very comfortable. Both looked out onto a pretty, private patio where we had afternoon drinks enjoying views of a lovely big tree and an old abbey. The location was great - a 5 minute walk from the Cite (castle/fortress). A tabac (newsagent), small general store (epicerie) and patisserie were all only a minute's walk down the street and the service at all 3 was friendly. Also, it was a real advantage to be able to park our car directly in front of the apartment. The only things we were a little disappointed in were the views from the kitchen and sitting room. They were obscured by old, orange, diaphanous curtains which could not be pulled back, making the rooms gloomy, especially when it rained. Although the view of the houses across the street was not particularly inspiring, we would have enjoyed seeing the upper half of the cite ramparts lit up above them at night, if we not for these curtains. Also, the lighting in the second bedroom was very dim. Ideal location on Rue Trivalle below the medieval citadel and just over the bridge from La Bastide St Louis. The apartment is 90m2 with an interior courtyard and private parking space. It is 3 miles from the airport and 3 miles from Carcassonne beach. All Carcassonne's attractions can be reached on foot. All sorts of shops and services are nearby. Un accompte de 30% doit être verser pour confirmer la reservation. La réservation est ferme dès la réception de l'acompte. Le solde sera versé le jour de votre arrivée avec la caution. La caution vous sera restituée le jour de votre départ aprés l'état des lieux de sortie. Le ménage de fin de séjour est optionel, facturé 25€ si non effecué par vos soins.